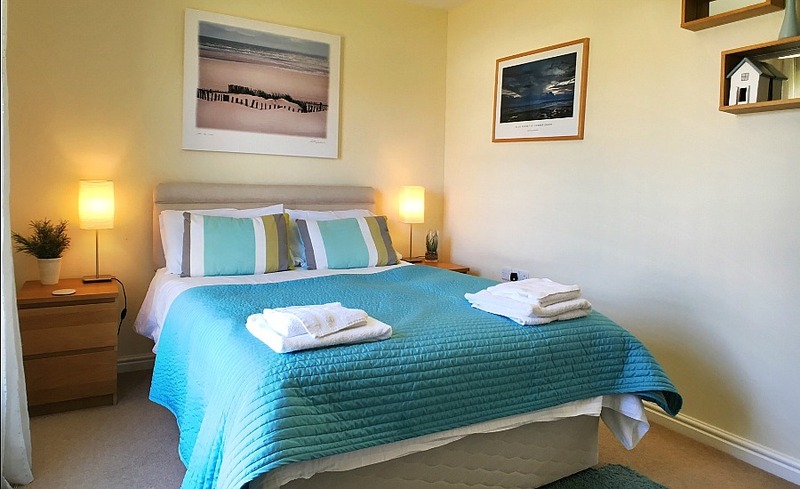 By-the-sea charm abounds at Seabreeze, an adorable Camber Sands holiday cottage at the award-winning community of Whitesand, just a 5-minute stroll over the dunes to the beach. Unload your luggage—both literal and metaphorical—and find your calm amidst imaginative, contemporary décor and views of a landscaped reed-bed and stream. Active travelers will appreciate the secure shed at Seabreeze, perfect for storing wet suits, boards, and golf clubs—there are even brackets for mounting kite buggies and other equipment. 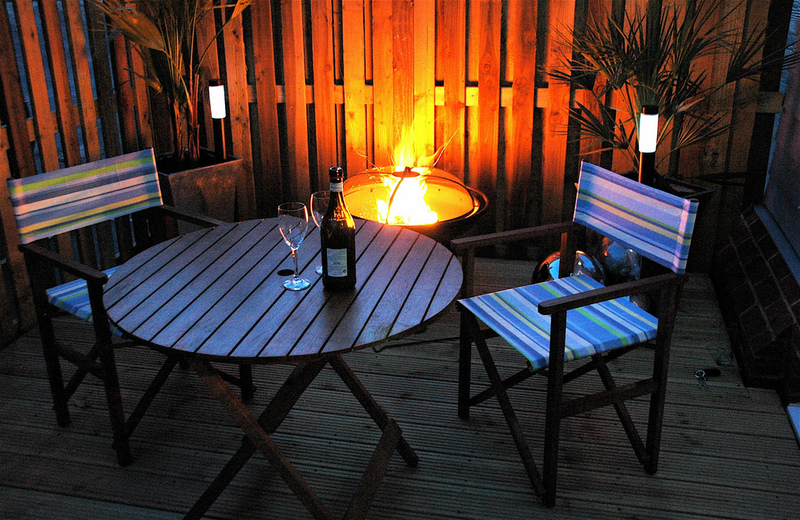 After a hard day on the beach, crack open a beer on the fully decked, south-facing garden. 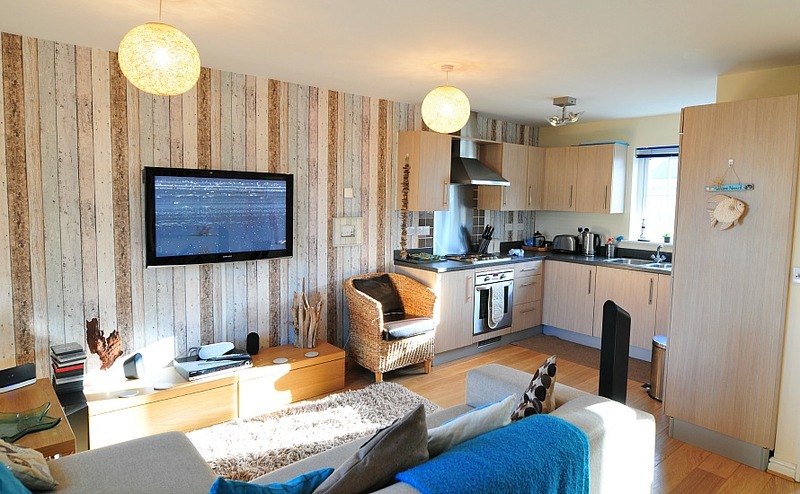 Or head inside to the open-plan living area with a 42″ plasma TV and free WiFi. 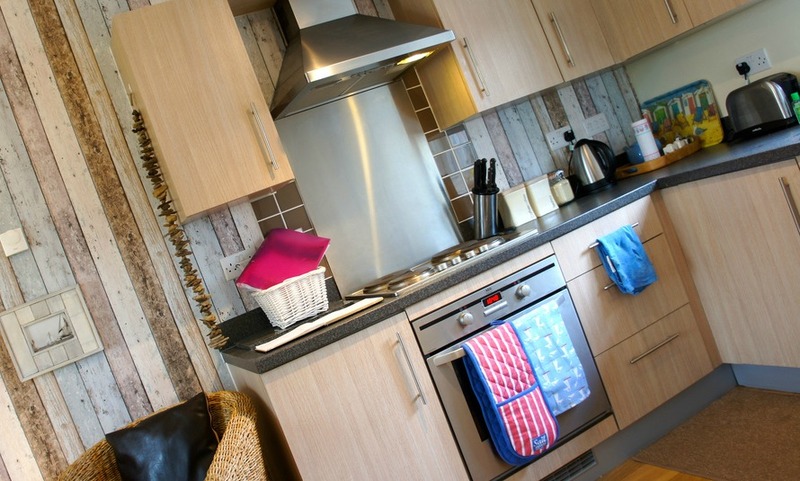 The ground floor comprises a cosy, open living area and kitchen, ideally furnished and equipped for rainy days or relaxing evenings after exploring 1066 Country. 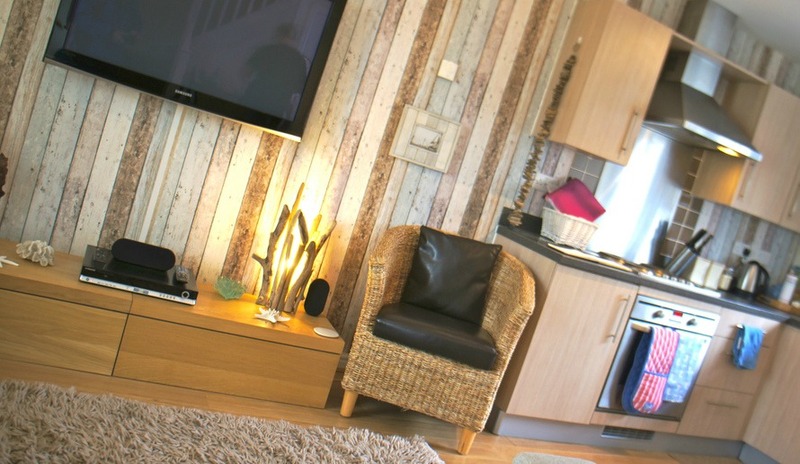 Cuddle up on a comfy sofa and watch the 42″ flat screen TV, or share holiday snaps using the cottage’s free WiFi. Cook up a family meal in the well equipped kitchen with an electric oven and hob, a microwave, a fridge/freezer, and a dishwasher. Then tuck into your meal out on the garden’s bistro table. 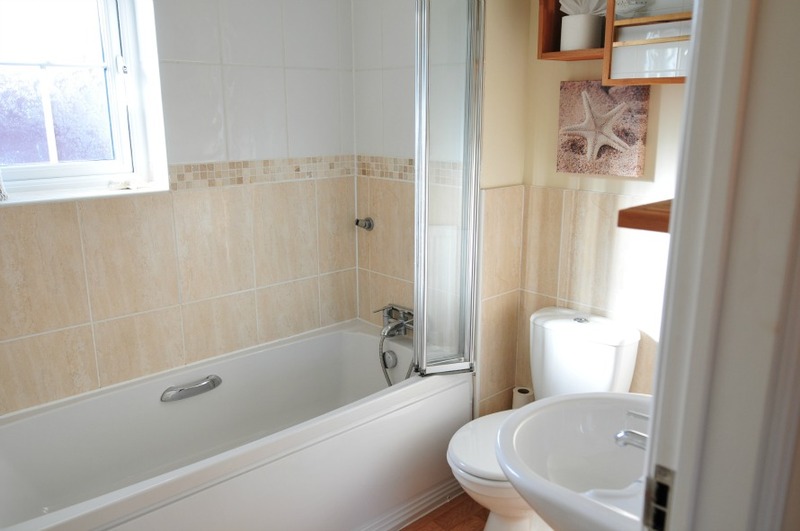 Both bedrooms are located upstairs and share a bathroom with a shower over bath. Choose from one bedroom with a double bed and another with two twins—the ideal setup for a family holiday. All linens and towels are provided, along with Molton Brown soaps and other little surprise extras that will be waiting for you. Keep your beach towels clean, too, thanks to a utility room with washer and dryer. Your group will love the landscaped and decked garden—a cosy nook in the sunshine with a bistro table and a privacy fence so that children and dogs can securely explore the space. Dogs love a big sandy beach – space to run around, sand dunes to explore, water to splash in, interesting smells to discover and plenty of other dogs to play with. So when you bring your four-legged friend to Seabreeze, it’s good to know that the incredible dog friendly Camber Sands beach is right on your doorstep. They will be in hound heaven! 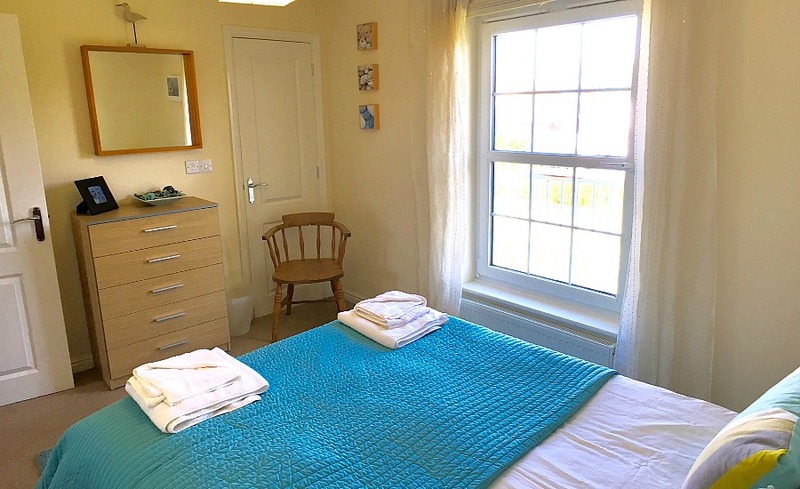 Our dog friendly Camber Sands holiday cottage, Seabreeze here at White Sand is the perfect place to bring your faithful furry companion. Camber’s huge sandy beach on your doorstep, lots of great places to go for walks and even dog friendly pubs so that you can both enjoy a relaxing drink after a day of sniffing about on the dunes! 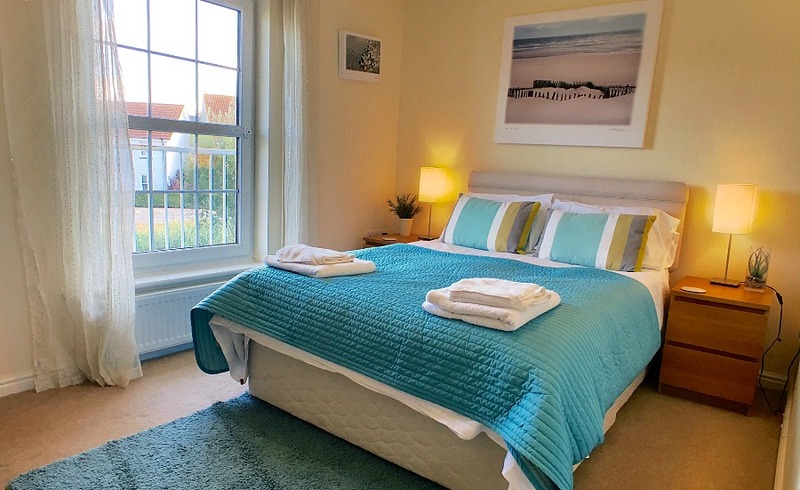 With the blend of tradition and culture in Rye and the beauty and tranquillity of Camber Sands, Seabreeze is ideally positioned to enjoy the very best this unique corner of England has to offer. Myself and three friends rented the cottage for a New Years Eve getaway and we were not disappointed! The cottage is really cosy and the finishing touches in all of the rooms really make a difference in making it feel like a home. It was also lovely to find the owners had left us a little welcome pack, a very nice touch. It was easy to find with good parking and everything you could want for a break at the seaside…the only thing missing was the sunshine! I would definitely go back! 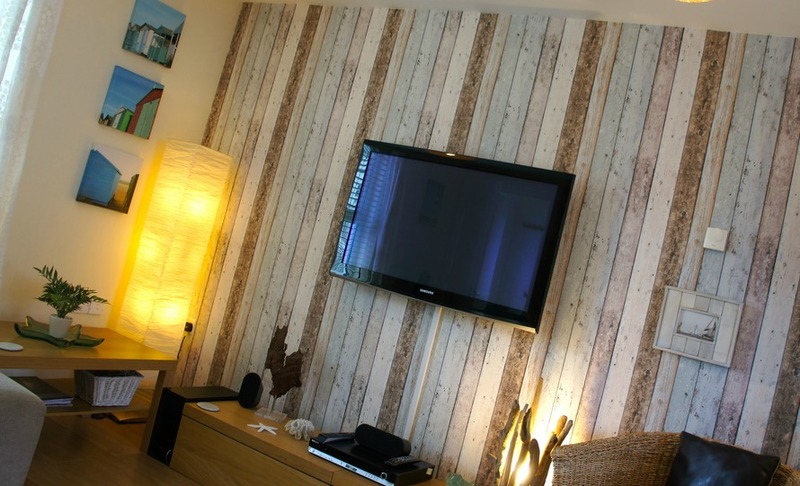 We had a fantastic weekend at SeaBreeze as a family- the house is modern, well equipped and decorated to a high standard. We were in walking distance of the beach and I would recommend the property and the location for families or friends wanting a weekend away. Thank you for a great weekend and some lovely memories!. Lovely little cottage, close to the beach with all the mod-cons needed for a home away from home; a well stocked kitchen, good sized bedrooms and a little courtyard. The wifi was a bit of a let down as it drops in and out so I would not rely on it if you’re planning on streaming movies. Our first impressions were warm, cosy and immaculate. It’s been very tastefully decorated with a seaside theme – I may have to steal the idea for driftwood shelves!… and immediately felt very welcoming. We stayed with our two terriers and on the first day walked straight from the cottage onto a footpath through the marshes that took us to Rye via the harbour. Luckily there was a lovely dog friendly pub called the Ship where we warmed up by the open fire where we had a chance to taste the delicious local Scallops and organic larger before making our way back. We were out walking for about 6 hours and the last hour of the walk we got caught in a snow storm, so was even more enjoyable getting back to our cosy bolthole and curling up on the couch to watch a film with some Cheese on toast – courtesy of the welcome goodies left for us. The next day we went for a dunes walk – again straight from the cottage so no need for car. It was absolutely stunning and we finished it off with a trip to Dungeness and another pub lunch. We chose the cottage for a weekend out of London. From the booking to arrival all correspondence was extremely helpful and friendly. Arrived early and were met by Cheryl who allowed us to drop the bags early and head down to the beach. When we arrived back, there was a welcome package of bread, cheese, wine and more which I thought was a great touch. Our dog was welcome which was the main reason we chose the cottage and she had a fabulous time. 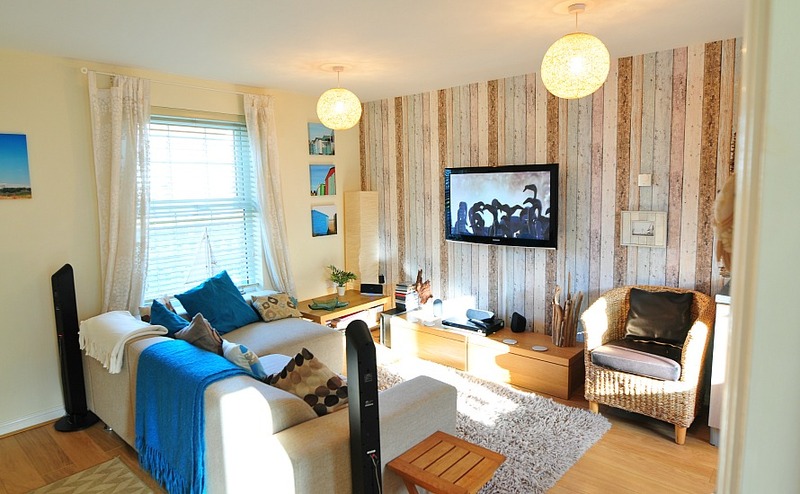 The property was clean and spacious with a lovely seaside decor. I really appreciated being provided a bbq at short notice which topped off the trip. I would certainly recommend this property to my friends and we will definitely be visiting again. 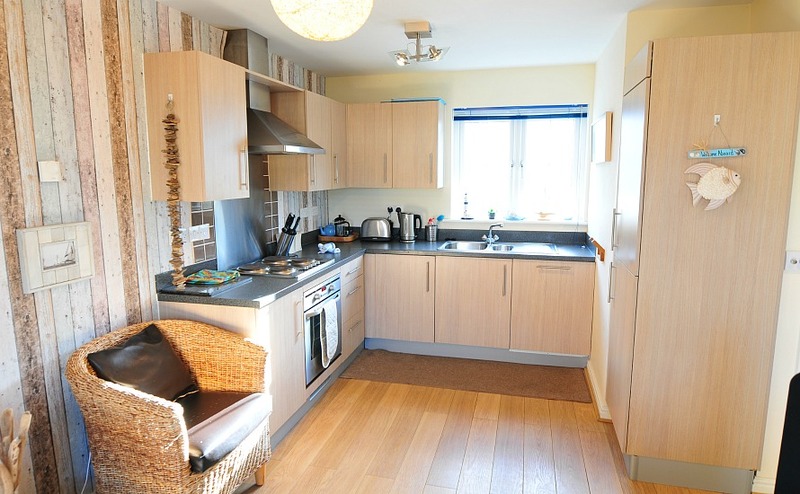 Overall, a fantastic holiday and great location, 5 mins from the beach. Loved it. It was a lovely week with only 2 hours of rain on Friday morning but alas it went too fast. The house is lovely and it was just what we had wanted for things to do and easy access to the beach. It was very well kitted out which was great. We would definitely consider coming back as it was only 2 hours away. We had a lovely holiday thank you. The house is very nice . We have absolutely no complaints and would happily return. We will be booking beside the sea holidays in the future. We very much enjoyed our weekend at Seabreeze. The development and house are both very attractive, and I hope we’ll be coming back to stay again. I very much enjoyed my stay at Sea Breeze. It was a well equipped and comfortable house that was perfect for me and my dog. The sofa was extremely comfortable and I ate breakfast on the sun-drenched deck each morning. It is also only a very short walk to the beach. Importantly the heating was very effective and there was plenty of hot water. Myself and hubby stayed at Sea Breeze for a last minute break. 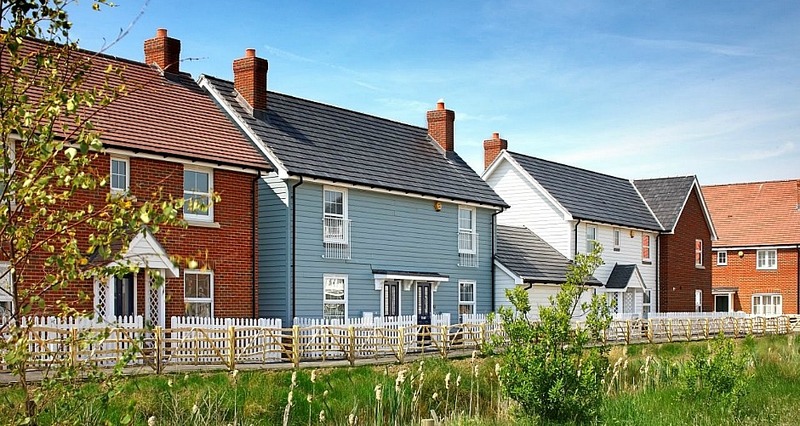 Ive always wanted to go to Rye and this lovely new cottage was within an easy drive to it. We booked late and had great service from Richard who gave us lots of info about the area and was keen to ensure we enjoyed our stay. The owners had left us some groceries and a bottle of wine, which was a nice touch. My friends and I just came back from a extended weekend at this lovely cottage. Despite the impressions you may get from the video. The property is actually bigger than expected. 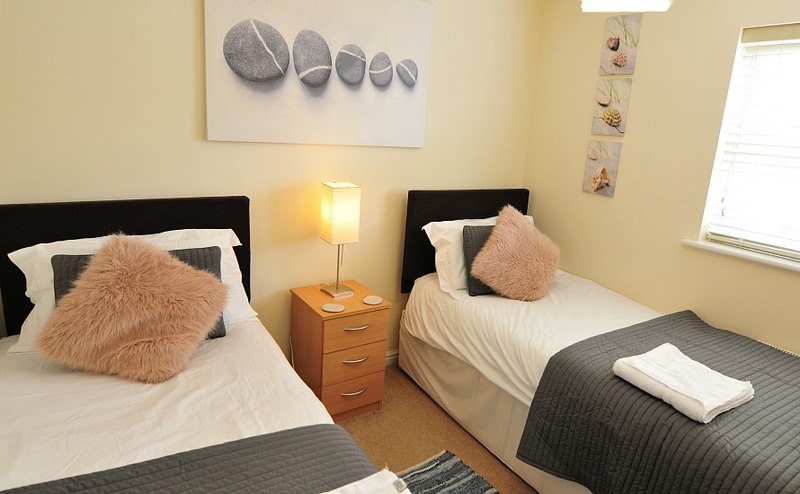 The bedrooms especially are a great size and the whole property is furnished to a great standard. Sleeping in the beds was a dream and no one of my group could believe how great they slept in Camber. It’s unfortunate however, that the sitting room/kitchen don’t facilitate enough room to have a nice sit-down meal for more than 2 people (this is due to lack of space and due to lack of a third and fourth dining chair) – We just made due with eating at restaurants in Rye. While the town of Camber itself is definitely more of a holiday destination with businesses shut in low season, Rye alone is worth the trip. The Sea Breeze was the perfect place to get a weekend of quite time away from London off season. I can imagine that the nearby sandy beach will bring many holiday goers in the summer, which in turn would make it the perfect beach-holiday location. As we were “snowed in”, we weren’t able to use the great BBQ outside, nor were we able to explore all amenities that camber has to offer, we would however recommend this particular property to anyone that is thinking of getting away from London and maybe enjoy some dips in the sea. Richard from beside the sea has been an absolute star and we’ll definitely be renting properties through him again shall we wish to come back to Sussex!